THIS ITEM IS NOW SOLD. cONTACT ME IF YOU REQUIRE SOMETHING SIMILAR. 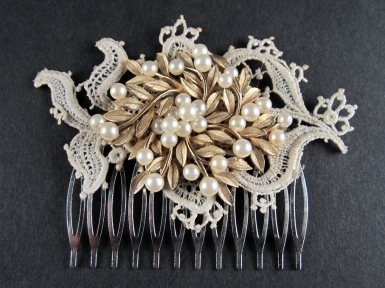 An beautiful silvertonehaircomb comprising vintage goldtone ornament with faux pearls set on an antique lace. The comb itself is 65mm wide. It comes beautifully presented in a black and gold embossed fur-lined (faux of course! )box.